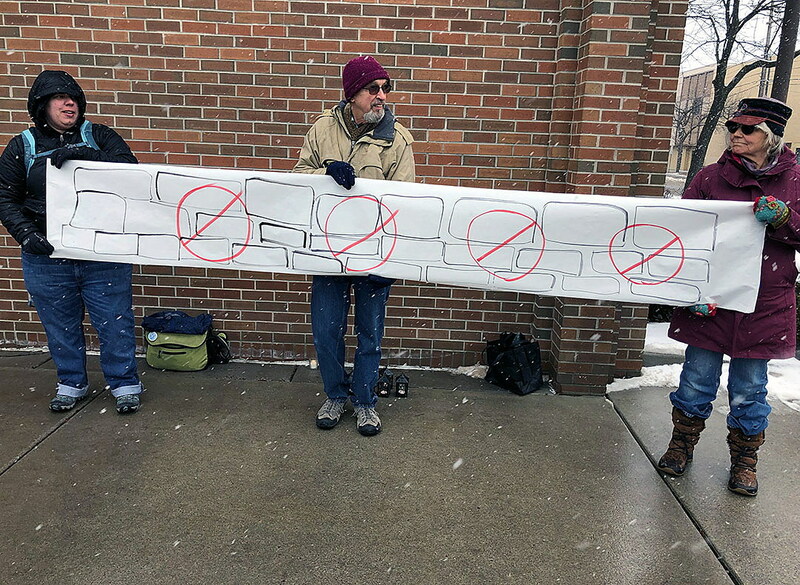 Members of Montana for Immigrant Justice gathered Wednesday at the Russell Smith Federal Courthouse in Missoula to protest funding for President Donald Trump’s wall along the southern border with Mexico. The vigil came in response to a bipartisan congressional deal announced Monday night to address border security and prevent another government shutdown. The plan’s inclusion of more than $1 billion for border “fencing” drew a rebuke from Laura Folkwein, co-chair of Montana for Immigrant Justice, who said extending the existing wall is unnecessary. “This current proposal includes funds for 55 miles of additional border in the Rio Grande Valley, which is a really biodiverse region along the river and it’s also traditional indigenous land, so there are a lot of pretty sticky issues with building any more wall through that area,” she said. Republicans have pressured Trump to accept the spending deal rather than close the government again on Friday. The new deal proposes $1.375 billion for new fencing along the border with Mexico and would give the U.S. Department of Homeland Security power to increase the number of beds to shelter detained migrants. About 40,000 beds are proposed to be funded for detainees with the oversight of Immigration and Customs Enforcement, or ICE. “We are also strongly opposed to any additional funds going to build ICE forces or toward a Customs and Border Patrol increase. These organizations operate with impunity, with very little oversight, and they conduct human rights abuses on a regular basis. This is not a way to keep anyone safe,” Folkwein said. Folkwein said that border towns have some of the lowest crime rates in the country, and that border crossings are down. The Russell Smith Courthouse deals with federal immigration hearings, and the group hopes to get the attention of Sens. Jon Tester and Steve Daines and Congressman Greg Gianforte about the issue as conversations over the deal continue. Tester is on the bipartisan committee that developed Monday night’s compromise border security plan. Nereyda Calero, a member of Montana Immigrant Justice who is a Deferred Action for Childhood Arrivals, or “Dreamer,” is from Mexico. She works at a Missoula hospital and said she was almost assaulted by a patient because of her skin color. Animosity over the border wall is intensifying and she’s scared for the future.